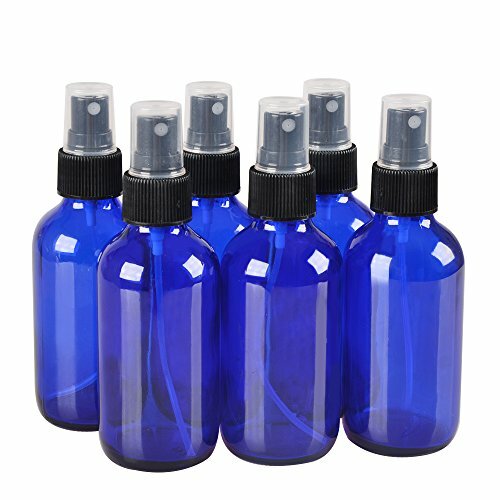 6 Pack,4oz Blue Glass Bottles with Black Fine Mist Sprayer.Refillable & Reusable.Designed for Essential Oils, Perfumes,Cleaning Products,Aromatherapy.6 Chalk Labels as gift. 6 x 4oz. Blue Glass Bottles with Black Fine Mist Sprayers,Dust Caps and 6 Chalkboard Labels. Perfect Design for Essential Oils, Perfumes,Cleaning Products,Aromatherapy. Refillable & Reusable Bottles.Eco-friendly.Potable,Safe and Convenient Packaging. Safe, Secure and Convenient Size Makes it Perfect for Traveling. High quality and very good price. Great for my essential blends!